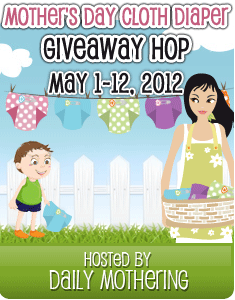 Each blog has a cloth diaper prize valued at $15 or more, and many blogs have prize packs worth over $100. And, don't forget to enter the GRAND PRIZE giveaway at Daily Mothering for your chance to win this amazing $1300 Cloth Diaper Prize Pack! The giveaways end on May 12th. A big thanks to my sponsors!